While the idea of a two headed creature was hardly original, the "double-headed evil strategist" named Two-Bad was definitely a first in the line. 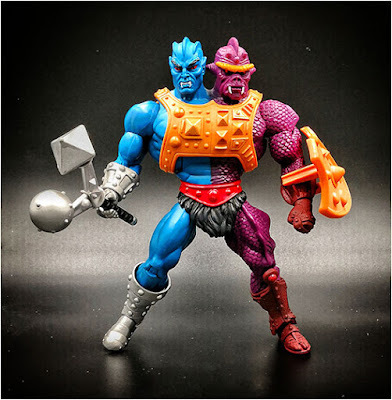 After years of using the same general torso for all of their figures, Mattel had to resort to sculpting a brand new one in order to accommodate this new two head villain’s design. This was something that immediately drew attention to this toy and made him instantly stand out from the other masters. Two-Bad’s newly designed torso also had an extra action feature aside from the usual spring loaded power punch waist gimmick. His two arms were also spring loaded, supposedly to allow him to entrap any unfortunate hero in a crushing bearhug. 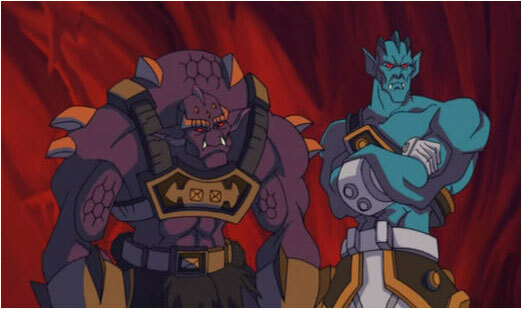 Anyway, aside from an interesting design, Two-Bad also had an interesting design origin. It’s not uncommon for original character concepts to turn out rather different from the finished product. And it is also common for characters to develop or be portrayed differently from how they were originally intended to be. In Two-Bad’s case both happen to be true. 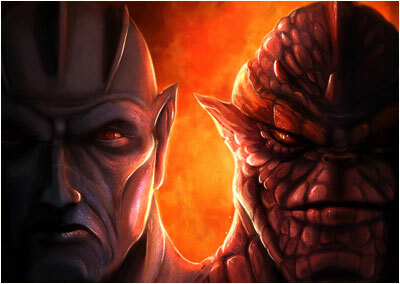 The idea of Two-Bad originally started out as the warrior named Schizo and was meant to be a character that was half good and half evil with both halves constantly battling each other. While it was an interesting idea for the time, Mattel had no idea how to market a half-good, half evil character so they just went with making him fully evil instead. And while he was originally introduced as a master strategist due to his having two heads..thus two brains, in most other media, most notably the Filmation cartoon, he was instead portrayed as a character whose heads were constantly arguing with each other for more comedic relief. And to seemingly drive that point home, remember his original toy’s bear hug feature? Well the arms were actually positioned in a way that if you pulled them back and let them loose, they would actually end punching the face located on the opposite side of the torso, enabling him to actually fight with himself. 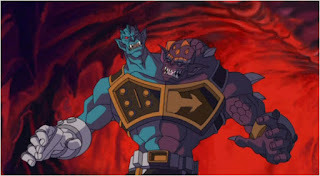 While the two headed creature is an interesting dynamic and had potential for some interesting characterization, initially, Mattel never really explored it. Each half was simply referred to as “Blue Head” and “Yellow Band” and all they did was argue, with neither head displaying any distinct personality. 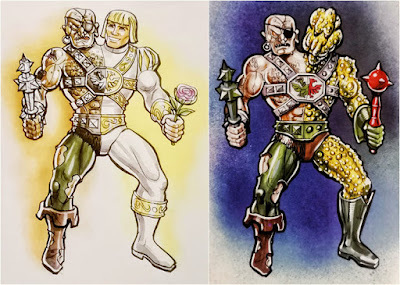 It’s worth mentioning though that in one printed story in an Italian magazine, Two-Bad is given the power to create the illusion that he is two separate warriors, and it is suggested that he does have 2 distinct personalities. 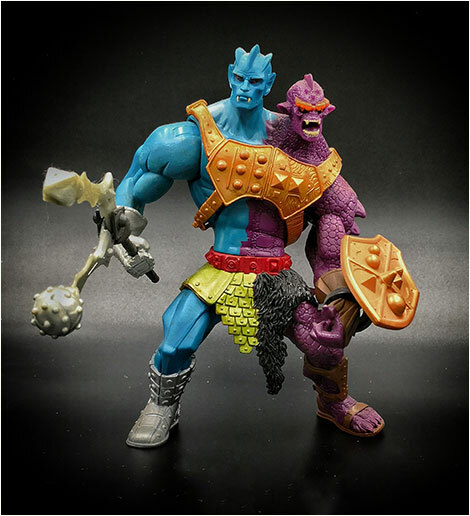 His Blue side developed a soft side for the heroic warrior Teela when she told him that she had always felt sympathy for him being stuck to his more annoying purple side. Of course she could have easily just been playing him, but it was enough to convince Two-Bad to actually save her when she was in trouble. Finally, a proper origin story was given to Two-Bad in an episode of the 2002 cartoon reboot. 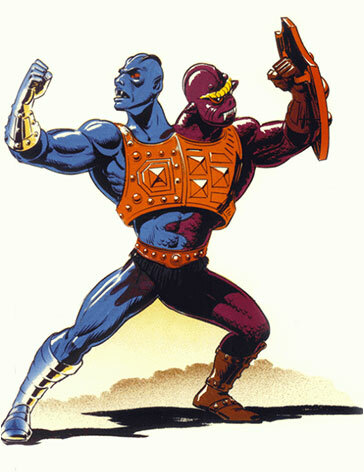 In this new series, Two-Bad was initially two completely separate beings, the tech savvy Tuvar & the more beastial Baddrah who were rival bounty hunters hired by Skeletor to take down He-Man. Due to their inability to work together (and a little meddling from Skeletor’s other jealous henchmen), they were ultimately defeated and as punishment, Skeletor fused their bodies together to form Two-Bad. "So refuse to work together as I commanded. Don't like each other. (hmmm) Well then, TOO BAD!" As Two-Bad the bounty hunters reluctantly served under Skeletor but they never learned to get along and continued fighting each other. In one episode, they even sought an ancient spell of separation to undo what Skeletor had done to them and almost ended up splitting the entire planet of Eternia in half before they were eventually stopped. 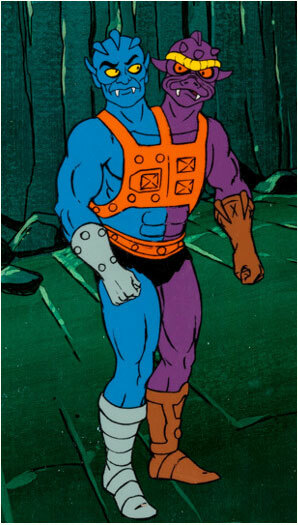 Because he was released towards the end of the line, Two-Bad will never be as popular as most of Skeletor’s earlier more established henchmen, but his two heads will always insure that he will always stand out from the crowd. It’s a small consolation to such a sad and cruel fate.